Fun is brewing with this beer-drinking board game. Fun is brewing across the board with this hopped-up drinking game. 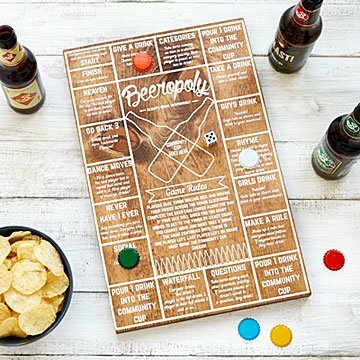 Perfect for parties or just to start the weekend right, Beeropoly invites players to quaff their way through a series of beer challenges—from a rhyming competition to demonstrating their best dance moves. Players take turns rolling the dice (included) and moving their bottle cap pieces around the handsome pine wood board. They complete the beer challenges along the way and risk elimination. The last man or woman standing must drink the Community Cup. Cheers! Handmade by Jackie McLane and Micah Renner in Omaha, Nebraska. A husband and wife team, Jackie and Micah, have always love the idea of making things that can be enjoyed in everyday life. Each one of their pieces is crafted by hand, unique in its own way. They love coming up with designs inspired by the stuff they enjoy doing -whether that be brewing beer, cooking, gardening, biking, or spending time in the outdoors. Together they work in their small shop in Omaha, Nebraska with the goal of making quality handmade products and the hope of sharing a little piece of what they value most: hard work, self-reliance, simplicity, and community. Beeropoly includes game board, dice, and 6 colored bottle cap pieces. Super cute product. Great for game nights! It was a secret Santa gift. Very sturdy made with great craftsmanship. Got exactly what was promised! Great for a family/friend ski trip, fun activity for some drinking and having fun while staying in! Very cool product, like kings but on a board! We love games and this one was perfect for us! It's kind of like the traditional card game kings but on a board and with a lot of fun things to do to make hanging out together interesting! Every year I try to find something from my oldest 30 plus grandson. As soon as I spied this item in the catalog last Spring I have been waiting to gift it to him. I have never seen it but he made a point of telling me how much he likes it, enjoying with his friends. This game is even more fun than I expected it to be. If you have more players, just grab some extra beer caps!